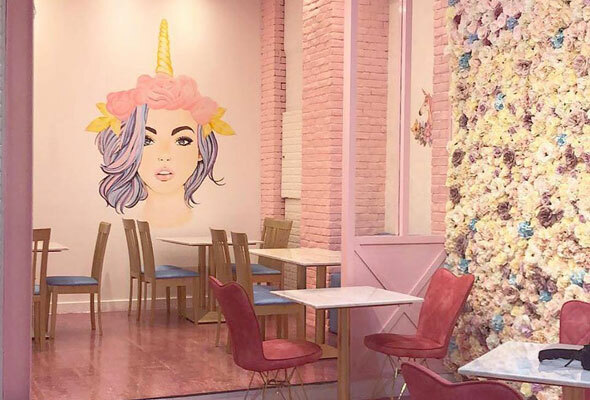 Dubai’s Al Wasl Vita Mall has just welcomed a unicorn cafe and we’re already totally obsessed. The aptly named Unicorn Vibes cafe is a cosy, all-pink cafe that comes complete with unicorn wing murals, a flower wall and whimsical furniture which wouldn’t look out of place in Wonderland. Unicorn Vibes first opened in Business Bay in June 2017 as an ice cream parlour, but relocated to it’s new Al Wasl home last month and reopened as a cafe. On the menu, you’ll find pink pasta, vibrant pink acai bowls and chocolate brownie and ice cream ‘heartbreaker’ cakes. To drink, you’ll find a rose iced coffee that comes out in a baby pink hue, bottled unicorn tears and cappuccino’s topped with unicorn foam. Because what else would you top a cappuccino with?